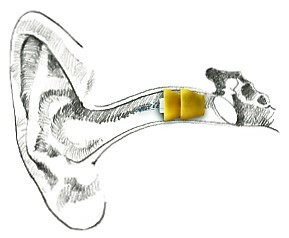 Lyric is completely invisible and is the worlds first hearing aid which can be worn for extended periods of time. No one can see how well you can hear 24 hours a day, seven days a week. The Lyric device, from Swiss hearing aid manufacturer Phonak, is placed completely in your ear canal by a trained professional, it is just 12mm long and sits just 4 mm from your ear drum. Lyric offers exceptional sound quality and is the ultimate invisible hearing aid. It uses the natural properties of your ears anatomy so you are hearing the way your ears are designed to! This presents sounds to the brain as they are supposed to be. Giving you a natural sense of hearing, Lyric gives you exceptional hearing and lets you live your life without constraints. Lyric is 100% invisible! Lyric sits completely in the ear canal and is the most cosmetic hearing aid on the market. Lyric is completely effortless, you can wear Lyric for all your daily activities, including showering, exercising and sleeping. There are no daily insertion or removal, battery changes or maintenance leaving you free to live your life. Lyric offers fantastic sound quality, you are using the natural properties of your outer ear to improve localisation, feedback and occlusion. Lyric has been available in the USA since 2007, where there are thousands of people worldwide successfully wearing the instrument, who constantly benefit from the updates in technology they get with Lyric. As the device is replaced every few months with a brand new product, you can continuously benefit from all the updates in technology that are made available. Lyric_Fitting from Audi-Lab Hearing Practice on Vimeo. Lyric is completely different to any other hearing aid on the market, due to the fact that it can be worn continuously for months at a time. You will have no daily reminder of your hearing loss and people who currently wear Lyric say that they no longer feel like they wear a hearing aid. You will have the freedom to shower, sleep, speak on the phone, hear a whispered goodnight from a loved one and do all the things that we should be able take for granted without the sometimes irritating constraints of a hearing aid. You can wear Lyric for all your daily activities, including showering, exercising and sleeping. No daily insertion or removal, battery changes or maintenance. With no daily insertions or removals and no battery changes the Lyric is truly hassle free. It delivers better hearing with little or no input from you. So you can get on with your daily life, live life without constraints, the way it should be. "I have been wearing Lyric hearing aids now for almost a year and it has changed my life for the better – I no longer struggle to hear, even in noisy situations"